Edinburgh is well known for its enriched castle, medieval town, hills and friendly people but what can be said about their burgers? The choice of restaurant wasn’t typically Scottish but I like to believe that all the ingredients were sourced locally, especially considering Jamie Oliver’s reputation. Seated very central in a large hall with high ceilings, the waiters flowed around with a certain prowess, seeing to everyone’s requests with a personal touch. My meal this evening was the Jamie’s Italian burger w/ fries. Unfortunately this burger presented far too many critical mistakes, the beef burger was cooked beautifully but the quantity was overwhelming and this was the underlying issue. All other counterparts to the beef burger fell obsolete as the beef was extremely overpowering. 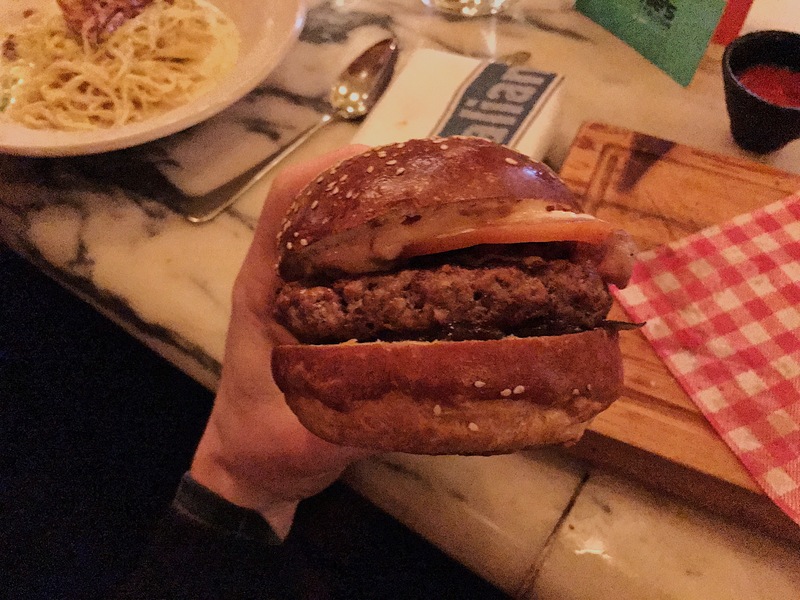 I can’t give a proper review on each ingredient as I truly didn’t taste them, other than the cheese, the cheese was full of flavour but was presented in a lump in the centre of the burger. Lastly, the seeded brioche bun, hard on the top, soft in the middle, with a sweet after taste – this was applaudable. Compared to the average burger this burger wasn’t too bad, it just wasn’t what they advertised on the menu. Average burger with great service. Burger rating; 5 out of 10. Thanks for having me Edinburger.